Right.. a decision should never be hasty and sometimes its good to just take a step back and call it quits. Well said! Yeah, at times when we take rash decisions and things are not working out, it's better to quit. Lovely shot! The Right Time to Quit, of course!!! true...quitting at da right tym! a lot of food for thought there! 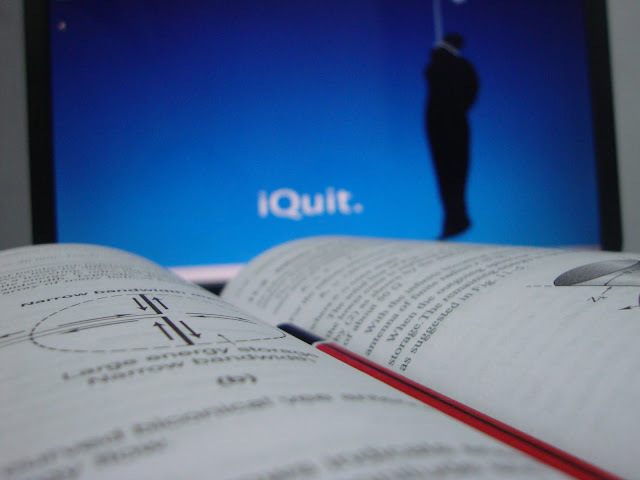 Quitting isn't bad, if it is your job that you are quitting to pursue new interests. 'Sometimes' quitting is the best decision one can make but 'not always' and it is not limited to jobs only. But you have a different point of view??? but I suggest you to give your views(some more description) or else the post looks so obvious.. like you should write about setting your goals first and then u should write y quitting can be totally fine. What do we call a man with no goals who quits. P.S. totally my views.. but the point u want to make is very nice. Yeah,.. You've got a point there. Thanks!! !